FOUNTAIN VALLEY, CA--(Marketwire - July 14, 2008) - D-Link, the end-to-end networking solutions provider for consumer and business, today officially launched the first device from the D-Life™ product family, a surveillance camera kit that enables remote viewing of live streaming video from a web browser. The new Internet Surveillance Starter Kit (DHA-390) is designed for the D-Life website (www.d-life.com) -- groundbreaking technology to activate and manage networking products via a website, providing customers with an easier way to experience a connected, digital lifestyle. With its simple web-based interface, the D-Life Internet Surveillance Starter Kit from D-Link -- bundled with Internet camera and two Powerline networking adapters -- offers consumers an effortless way to monitor the home, children and pets by providing email alert snapshots, live video monitoring over the Internet on a PC, and the ability to share camera feeds, even in low light situations. D-Link is also shipping the D-Life Internet Surveillance Expansion Kit (DHA-310) with camera and single Powerline adapter for those who wish to expand their home surveillance system with additional cameras. "D-Life represents a shift from a hardware-centric focus to one that is based on consumer product usage and services. With D-Life-Enabled products such as the DHA-390 and the D-Life website, everything just works. It's true plug and play, making it easier to install, manage and support D-Link products," said Steven Joe, president and CEO, D-Link Systems, Inc. "With this new user experience, even the most novice technical user can access, enjoy and define their digital lifestyle with ease." The D-Life cameras plug into existing power outlets in the home for connecting to the home network router and then out to the Internet, offering a true plug-and-play experience. To set up the Starter Kit, you simply connect one of the Powerline adapters to the router and then to a nearby power outlet. Then plug in the second Powerline adapter with the camera into any other power outlet on the same circuit in the home for easy connectivity. messaging and Internet voice mailbox. The D-Life experience will evolve to enable users to view and share news, weather and topics of interest, as well as post content relative to their digital experiences. 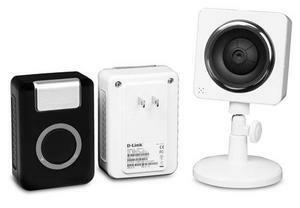 The D-Link D-Life Internet Surveillance Starter Kit (DHA-390) and Expansion Kit (DHA-310) are available now from D-Link's online store, D-LinkShop (www.dlinkshop.com) with MSRPs of $499.95 and $399.95, respectively. Both products will be made widely available through D-Link's network of retail, etail and catalog partners beginning later this year. D-Link, D-Life and the D-Link logo are trademarks or registered trademarks of D-Link Corporation or its subsidiaries in the United States and other countries. All other third party marks mentioned herein may be trademarks of their respective owners. Copyright © 2008. D-Link Corporation/D-Link Systems, Inc. All Rights Reserved.